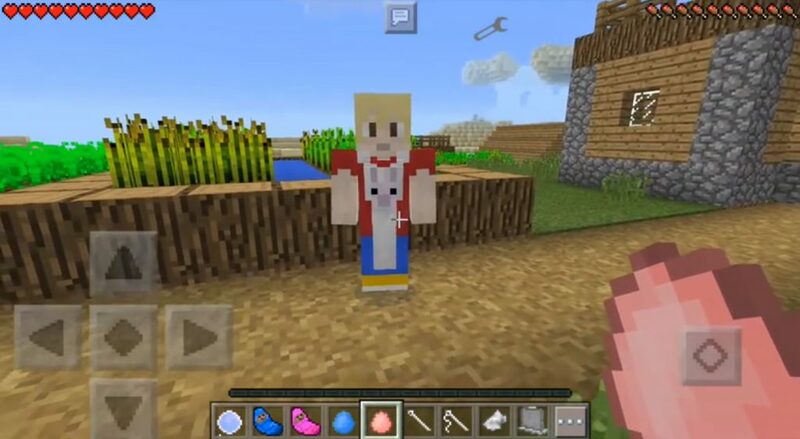 Significantly increase the functionality of the game Comes Alive mod for Minecraft PE 0.14.0. This modification contributes to the establishment of relations with the villagers. You will get the opportunity to communicate with them, trade, meet, make friends and much more. You can also create a real virtual family with its own special settings by choosing your own destiny. First of all, as we have already mentioned, you need to decide on your own destiny. It is absolutely not difficult to do this, but practically everything can depend on your choice. Starting the game in survival mode, in your inventory you will find a crystal ball. As oracles foreshadow the fate of such a ball, so it will mark the path for you in life. Crystal Ball (id: 4000) is activated by pressing it on the ground. You instantly find yourself in a room with various books and spells. Clicking on the table, you will see a dialog box in which you need to select your preferences. The first window will give you the choice to become your character. In the next window, you need to choose to become a character with whom you will create a family. There is a choice of self-stat mob, or this choice can be left for the program, which in a random order will decide this question for you. Next, the nick selection window opens, but at the beta testing stage it is not active, but in the near future this will be corrected. Now just click Continue (Continue) and get to the fourth screen. 1.I have a family: there is a family – you will enter the house with your wife and children. 2.I live alone: ​​loner – you don’t have a family yet, you get into the house where you will start everything yourself. 3.I live in a village: I live in a village – a mod teleports you to a small village. 4.None of these: none of the options – you will remain in the place where you appeared during the generation of the world. We will have to look for a suitable village on our own, as well as to improve relations with the residents of the settlement. As soon as you finish your choice, the most interesting will begin, namely the stage of interaction with other characters. You are looking for a suitable village among the seeders, or you immediately find yourself in some suitable area, where there are residents and walk around to them. 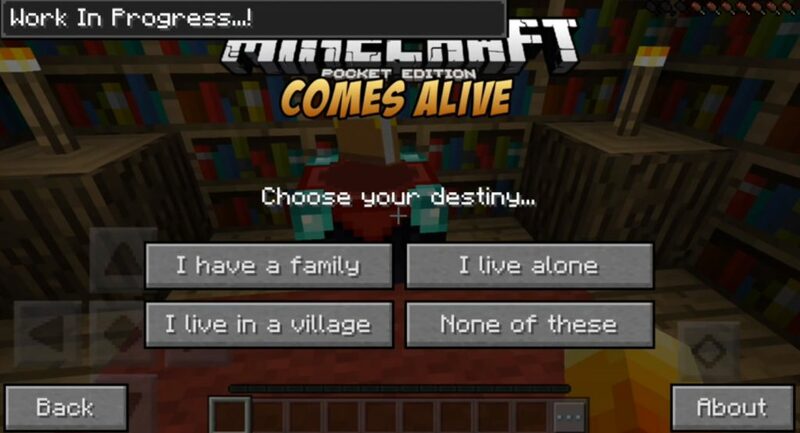 Comes Alive mod for Minecraft PE 0.14.0. After a long tap on the screen, the action button Interact appears. By clicking on it, you will open a menu for selecting communication options. You will see the name of the mob, his mood and character, as well as marital status. On the same screen you will see the choice of actions with which you will be able to improve relations with this little man. Follow me: suggest to follow you. Stay here: offer to stay in place. Move freely: free movement of the mob on the map. Trade: trade with a character. Set home: set a home. Most of these actions are not yet available, but in the future, the Comes Alive mod for Minecraft PE 0.14.0 will be improved and each function will become active. But now you can ask the character to move behind you and, for example, go to some romantic place to watch the sunset together. Go to the ModPE Script section and enable mods support. Select the Add item and select the mod that was downloaded in the archive. The mod in the new format .modpkg and already contains textures. Installation is complete and you can begin an interesting journey creating a new world in survival mode.